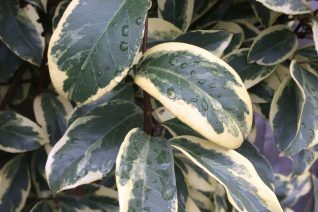 Elegant, sophisticated evergreen vine with large leaves margined in cream. Contrast with the cinnamon colored twining stems is striking as well. A close magnolia relative that display small pendant white magnolia-like flowers in July-Sept. vigorous easy to grow vine for a large pergola or fence. Twines strongly. Provide support. Full sun to quite a bit of shade. Best in rich soil with regular summer water. To 12′ tall in 5 years. Excellent on a trellis. Good looking year round. Easy to grow. Seems to prefer having its feet in the shade and the top in the sun. May become semi-deciduous in the coldest winters (below 10ºF). Re-leafs quickly in spring. Red berries often follow the small flowers. Japan.